Oscoda, Mich — The undefeated Oscoda Owls hosted the top of the North Star League-Little Dipper Posen Vikings Friday night. Posen Head Coach Chris Keller did a great job scouting the Owls because Posen was able to take an early 21-12 first quarter lead thanks to four players scoring 3-pointers. Then it was Oscoda’s turn to take control of the arc. Sophomore Gabe Kellstrom did just that knocking down three 3-pointers in the second quarter and Owen Franklin hit two tying this one up at 33 at halftime. Second half Oscoda tightened up their press and defense and Posen wasn’t able to knock down shots. The Vikings scored 33 first half points and only 14 in the second half versus Oscoda’s 23. The Owls took down Posen 56-47 improving to (13-0). 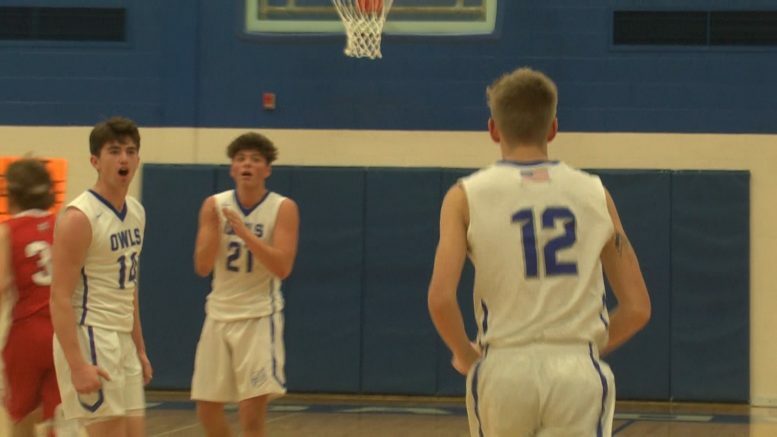 Up next, Oscoda faces Mio on Friday, February 1st for a North Star League-Big Dipper rematch that ended with a buzzer beater layup and Owls victory.